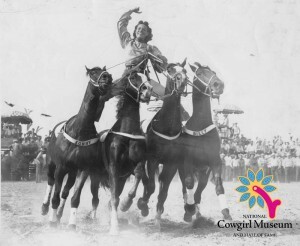 Known as the “Texas Tomboy” during her rodeo career, Wilma taught herself to rope using a rented donkey for practice. She became a champion roper and trick rider, dazzling audiences with her Roman riding act and her skill with a horse. She also trained and showed cutting horses before establishing her own riding school in California, sharing her knowledge of the show ring with her students. She has won worldwide acclaim for her skill as a teacher.